The key is to reveal the first point of the soul: the property of mutual guarantee. This is similar to the state of a body awakening from unconsciousness. That is the state the broken soul exists in. Such awakening of the soul may occur only when it is impacted by the Upper Light (Ohr Makif, the Surrounding Light) and is filled with the Upper Light (Ohr Pnimi, the Inner Light). There are questions concerning our world: What is the secret of life of the material body, and where does life come from? We could collect and connect all the necessary body tissues in a laboratory, but how do we light the spark of life in it so it may live? The source of life is not in our hands; we only manipulate the body while it is alive. But where in the bodily tissues does life reside, the force that makes the body alive? We cannot create vegetative matter from still matter, nor can we make animals from plants, and humans from animals. That is because the life force expands from its concealed plane. This life force can be revealed in mutual guarantee as the inner force of our oneness, if we desire to annul alienation between us and attract the force of the Creator. This life force is regarded as “the Creator.” When it becomes revealed to us, we start to understand to what extent all our previous existence has been just an outermost wrapper on this force. Laitman.com Post: How Can We Scream So We’ll Be Heard? A person needs the force of the Torah in order to reveal himself and reality in relation to the Creator. Being close to the Creator means being similar to Him, to the quality of bestowal and love. This quality becomes revealed to a person through his attitude to the neighbor, meaning to someone who is close to him by having the same goal in life. This is the right criterion for self-analysis and measuring your attitude to the Creator. A person’s qualities become revealed as evil because they don’t allow him to attain the goal. The force of correction, the Light, is revealed inside the unity between people who aspire to the goal. Then the evil inclination, man’s nature, helps him to unite with the Creator. At first the flaws of egoism (Klipot) seem like great obstacles. However, as we advance we discover the ability to transform them into goodness. They all become our point of independence (Klipat Noga), which enables us to grow. On the right side we have the Creator, and on the left side Klipa. We form ourselves out of both of them, creating our independent form of similarity to the Creator. When the force of the Light and the force of the darkness connect to each other correctly, they give rise to the form of Adam, a human being, in us. The human being in us is the degree of our similarity to the Creator. Everything is done by the Light. It reveals the force of the evil inclination in us, as well as its own force in order to develop egoism. As a result, we reveal their single Source, the Creator, and the distinction between good and evil or Light and darkness disappears. All forces and qualities form the image of the only reality, the Source. This constitutes all of the science of Kabbalah: the revelation of the Creator to the creatures, or rather, inside the creatures. Laitman.com Post: If The Soul Hurts, Hence It Exists! We "descended" from the World of Infinity to this world, from the property of bestowal to the property of reception. As we descend, the property of bestowal within us is decreasing, and, accordingly, the fulfillment (the Light, the sensation of the Creator) within us is diminishing as well. This continues until we reach the state of "our world," where all traces of the Light and the spiritual vessel (the desire to bestow) disappear totally, and we find ourselves completely cut off from spirituality. Above our world, in the worlds of Beria, Yetzira, and Assiya, there exist the broken souls, that is, the souls that sense their egoism. We need to "enter" there from our world, meaning to reveal that our souls are broken and disconnected. 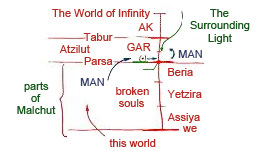 Afterward, we have to pass the border that separates the Worlds of BYA from the World of Atzilut (Parsa), that is, to fulfill the requirement of joining the process of correction: to wish to attain love and complete unification. By doing so we awaken our broken souls so that they include themselves into Malchut of the World of Atzilut which initially is merely a point that exists on Hazeh (chest) of Zeir Anpin. Above Zeir Anpin, there is GAR of the World of Azilut: Atik, Arich Anpin, Aba ve Ima, and Yeshsut. Above it, we find the next border: Tabur of Galgalta, the World of Adam Kadmon, and the World of Infinity. In our world, our souls are points. This is how a person perceives his spiritual state called "this world." Later, by attracting upon himself the Light that develops him, a person attains the sensation of himself in the worlds of BYA, that is, the sensation of the broken, egoistic desires (the states of the Egyptian exile). From there, we need to ascend toward the Light, meaning above Parsa because it’s impossible to perform the correction in the worlds of BYA, where there is no Light of correction but rather, the Light that exposes the evil. The Worlds of BYA (a place, a state, a sensation) are intended for the realization of evil, of the broken souls, so that we reveal how bad we are and how strong the grip of the evil inclination is. Then, to the measure of this revelation, we will be able to ascend upward and connect to Malchut of the World of Atzilut. The inclusion into Malchut of the World of Atzilut is called raising MAN, our prayer. Malchut of the World of Atzilut passes our prayer to Zeir Anpin of the World of Atzilut, and, as a result, ZON raises the MAN to Bina of the World of Atzilut. Then the Light (the Reflected Light or the Light of AB-SAG) comes from Above, corrects the connection in ZON, and fills them (ZON). That is, we only need to raise Malchut of the World of Atzilut, Shechina, that is now in exile. Everything that exists in the Worlds of BYA are parts of this Malchut, Shechina. We need to raise our desires there. Malchut of the World of Atzilut is the "Assembly of the souls of Israel" (Israel is those who aspire "straight to the Creator"), that is, the connection of the broken desires. Inasmuch as we are able to connect, we include ourselves into Malchut of the World of Atzilut. Surely, we cannot accomplish it ourselves; we can only ask. Malchut passes our request about uniting to Zeir Anpin, and to this very measure reveals that she wants to connect with Him. Meanwhile, ZA has to receive the desire to connect with Malchut from Bina. And then both, ZA and Malchut (ZON) rise, each with its own desire, to Ima (Bina), which unites them. Afterward, ZA descends to its place, gives birth to Malchut, and connects her to itself. To the extent that ZON are connected, the souls that exist in them participate in this connection and get filled from it. That is because these souls comprise the body of Malchut. How Can We Scream So We’ll Be Heard? What we are creating between us is interconnection, interdependence, mutual guarantee, love, and a definite necessity to be together. This is the connection (or the "place") we have to create so that inside it we will reveal the Creator who hides from us. He will speak to us from this place we create, "the tent of revelation." Without having this communication system between us and the Creator, we are just crying out into empty space. We can only turn to the image that we form through our connection: the Creator’s Temple. It is written that love for the Creator can only be attained through love for others. That is why we are building a spiritual system of mutual guarantee and mutual support among us. Its purpose is to reveal the Creator. Therefore, our primary necessity is to work on building the group. The first condition for receiving the Torah, the Light of Correction at the foot of Mount Sinai (the state of revealing mutual hatred) was the impossibility yet the willingness to bond together as one man with one heart, and to work on this unity by the principle, "we shall do and we shall hear." No matter how small our willingness to do this, if we have it, then we have a common point, a "window" through which we can turn to the Creator. This common point is already Malchut of the World of Atzilut, the Shechina. That is how we should understand the preparation for the reception of the Torah. In our world, we all feel one common world with the same senses. However, our qualities exist in a unique combination in every single person. Therefore, the picture of the world that arises in each person is also completely unique. It depends on the individual combination of his qualities that come from the root of his soul. Nevertheless, we all climb the same rungs of the same spiritual ladder. Thus, there is one science for all concerning the revelation of a higher life: the science of Kabbalah. It explains to each person how he has to advance. Everything we read about in The Zohar concerns our advanced states which everyone will have to go through. To the extent that we desire to feel them, we draw the force (the Light or Ohr Makif) from these degrees, and it develops us. As much as we exert our “baby” effort, we grow, develop, and ascend. It is essential for us to rouse the influence of our advanced states upon us. Therefore, the second and much more important aspect in our approach to reading The Book of Zohar is to understand that ascent implies unification. We climb a “pyramid” or a “cone” to the extent that we unite in our points in the heart. Therefore, all 125 degrees of the ladder from our world to complete perfection are 125 degrees of unification of desires until they merge completely in the quality of absolute bestowal. This means that the more we unite, the higher we rise, and to the extent that we connect, the quality of bestowal (the Creator) is revealed between us. As much as we are able to unite, we reveal the measure of unification between us, and this determines the measure of revelation of the quality of bestowal or the Creator. Therefore, when we read The Book of Zohar, we wish to be in this state, and we await its manifestation within us and between us. Every person has the right to examine whether the place he chooses to study is good for him. However, after a short test, he should make up his mind and enter the study process at the selected place without any further doubts. Otherwise, he won’t be able to reveal the Creator and His world. There are groups who claim that they study according to their own method. But how can there be a method that was not passed down through the chain of Kabbalists from master to disciple? It is impossible to receive such a method on one’s own. Only Adam HaRishon received this method “from Heaven,” as it were, and discovered it on “his own.” However, all the others, including Abraham, obtained it through the chain of Kabbalists. At first, Abraham was “an idol worshiper,” meaning that he was engaged in a special spiritual work, only in its reverse form, after which he realized its inadequacy. Twenty generations past Adam HaRishon, Kabbalah was passed on to Abraham. The method of attainment can be acquired solely through clinging to a teacher. This is the way it expands from Above downward through the chain of souls, from soul to soul. Can you really connect to the root if you are not Adam HaRishon himself? Only Adam HaRishon is tied to the Creator directly. All the other souls must receive from him through the chain of Kabbalists, depending on the soul’s place in it. Everybody receives from the one who stands before him, and is connected by a linked chain with one root. It is a hierarchic system similar to a tree. I am positioned in it at a specific place and can receive only from the person nearest to me and above me. For this, I need to annul myself before him in the same way a lower Partzuf annuls itself before the Upper One in the spiritual world. Therefore, when people claim that they receive “Light or enlightenment” from Above or while in sleep, they are not being serious. A spiritual contact can be attained solely by staying close to a Kabbalist while he is alive. If you manage to reach at least one such point of contact, from that point on, you can develop everything else. For this reason, out of all diplomas, the most precious piece of paper that I possess is a tiny newspaper article where I am named as a loyal student and the right hand of Rabash. It testifies, to the very least, how connected I was with my teacher. When we read The Book of Zohar, we should visualize being in a system or a mechanism to which my point in the heart, my spiritual gene (Reshimo) that desires to reach its practical realization, adheres. My further development, the impact of the system on me, depends on this adhesion. I stand opposite to this enormous system. If I don’t tune into it correctly, I will not be able to get it to work on me. It will still affect me, but solely through suffering and pain which doesn’t count as it is the natural way of development. However, I have a chance to plug into this system through my personal, inner effort. First of all, I have to try to understand what “oneness” or “connection” is. I should also realize that the connection with the system occurs inasmuch as I am connected with the friends. There is a basic law: If I am connected with the friends to 10%, I am connected with the spiritual system to 10% as well. If I am connected with them to 80%, I am also connected with the system to 80%. There is no other way to plug into the spiritual system for me. The greater our inner effort is to become one, to annul our individual material baggage, and to unite in our points in the heart (the only part of us that belongs in the spiritual system), the sooner we will unite to the degree of our oneness in our points in the heart. This is the very first preparatory stage. We must demand the strength to unite from the spiritual system since obstacles constantly urge us to escape. The system has to hand us the “glue,” the Light that Reforms that will connect us. It has to clothe us as one whole body and hold us together. Later, indeed, it will start “gluing” us at my request as if we were thousands of droplets of water merging into one enormous drop. Like in a hologram, there aren’t big and small elements in it, but everyone contains the entire picture. In this one collective wholeness, everyone loses his independence. In this way, the Light makes us one. Now, as we become a single point, the intention to merge with The Book of Zohar itself is emerging within me. What I am reading right now, all these properties, I wish to find between us. All of the characters The Zohar is talking about are types of connections between us, and they exist at each spiritual level. This is why the story always repeats itself at each spiritual degree. The entire Torah is present in any spiritual state. And it doesn’t matter what is read or in what sequence; you can read the Torah from any page. So now I wish to see all the relationships described in The Zohar in the connection between the thousands of points in the heart. I wish to start perceiving the connection between us in unison with the flow of the text of The Zohar. In this way, I start to reveal the story in its true form and eventually reach the state when I read and immediately realize the content within myself. However, where is that point of realization? It is in the connection between us. Through this connection, I discover a totally new world with new sensations and desires. I submerge myself deeper and deeper in another dimension in order to uncover this system together with the others and the Creator. I taste each word with my own senses, and this is what is called the Torah of Life.